In my version, I candy the crushed ramen noodles and almond slivers with a little butter and sugar – a simple step that only takes about 5 minutes on the stovetop. Then I cut back on the sugar in the dressing (there’s still plenty), and use rice vinegar and sesame oil for a more authentic Asian taste. The sweet/sour dressing works on just about anything, and will keep a long time in the fridge. (So make the full amount of dressing, even if you’re planning to make fewer servings of salad.) 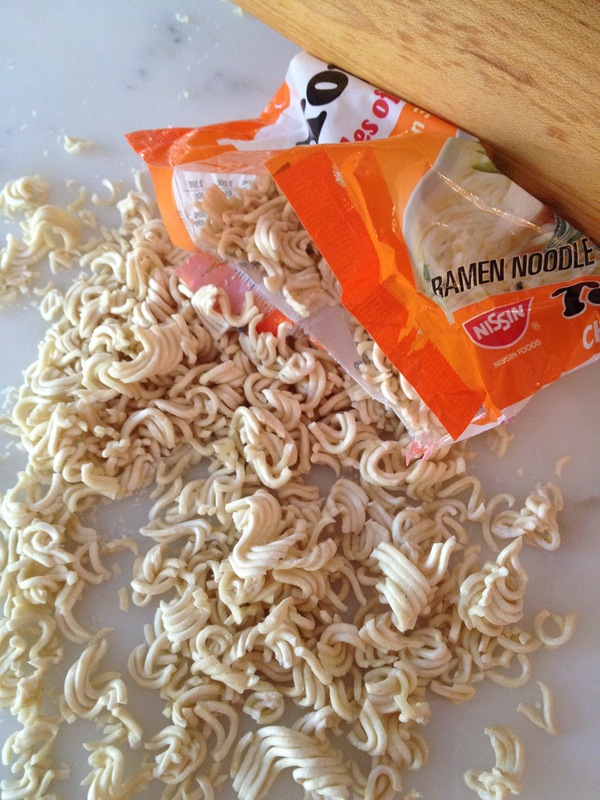 The ramen crunchies, however, will not last very long because they’re impossible to stop snacking on. If you can’t find baby bok choy (a delicate member of the cabbage family), you could use napa cabbage, kale, romaine – or mix-n-match. Add leftover chicken or shelled edamame for a light summer meal. Then sit back and enjoy your bestseller. Crush right in the packet, but gently so it doesn’t explode. 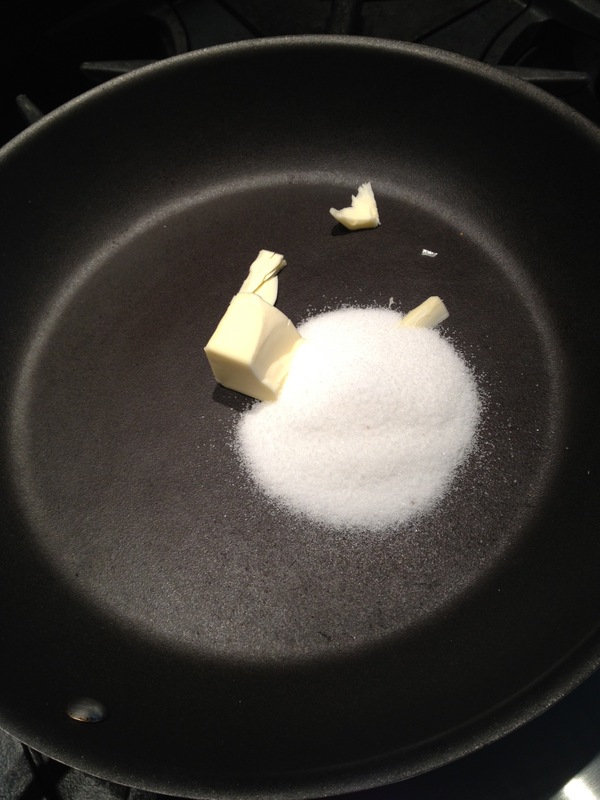 In a large nonstick skillet over medium-high heat, melt butter and sugar. 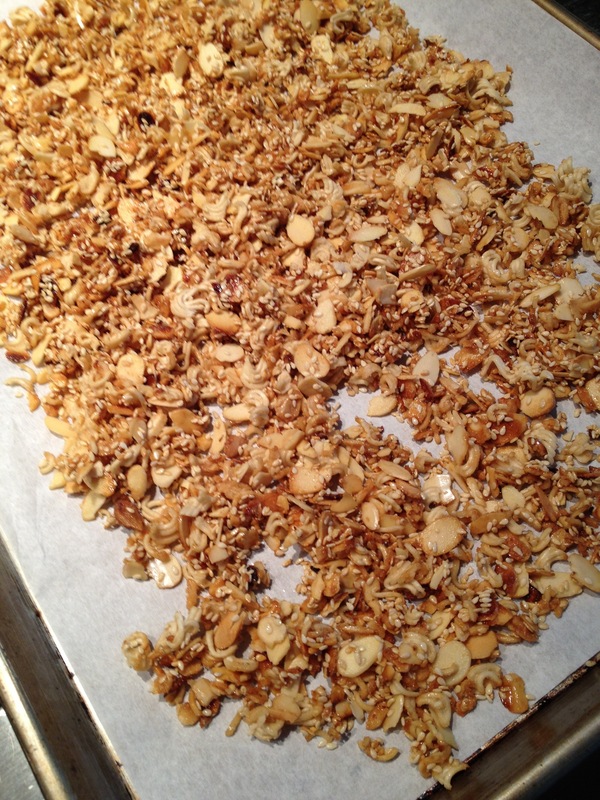 Add crushed ramen noodles, almonds and sesame seeds (if using). 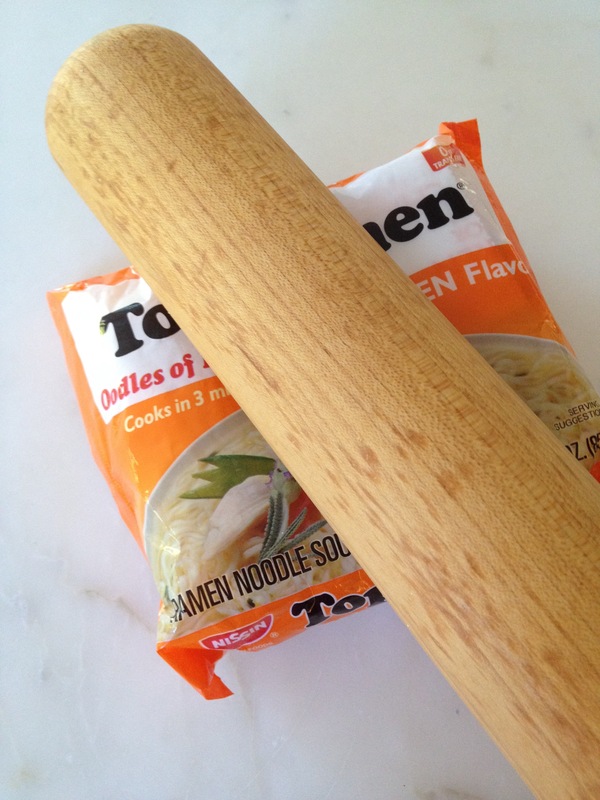 Stir to coat and continue to cook until ramen and almonds are golden brown (about 5 minutes). Transfer mixture to a baking sheet to cool. Add all ingredients to a jar and shake. 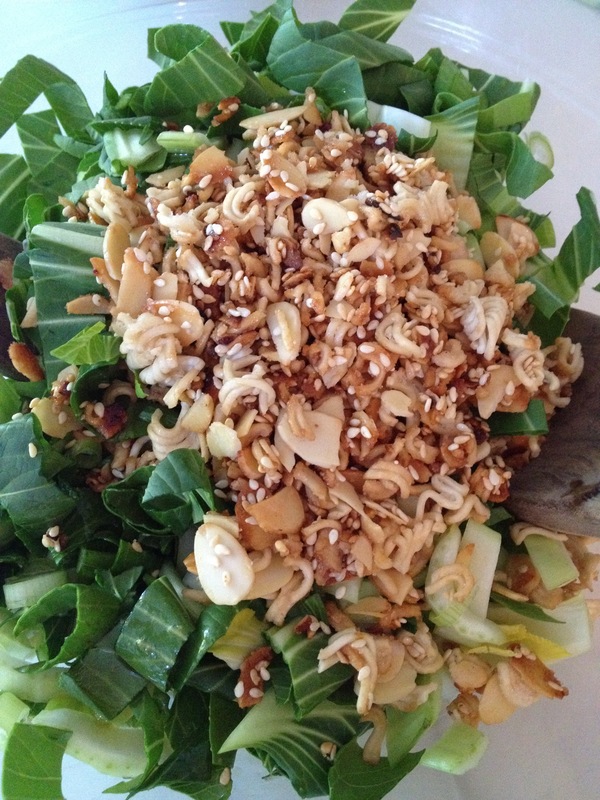 To a large salad bowl, add chopped bok choy and scallions. Refrigerate any unused dressing. Transfer any unused crunchies to an airtight container. 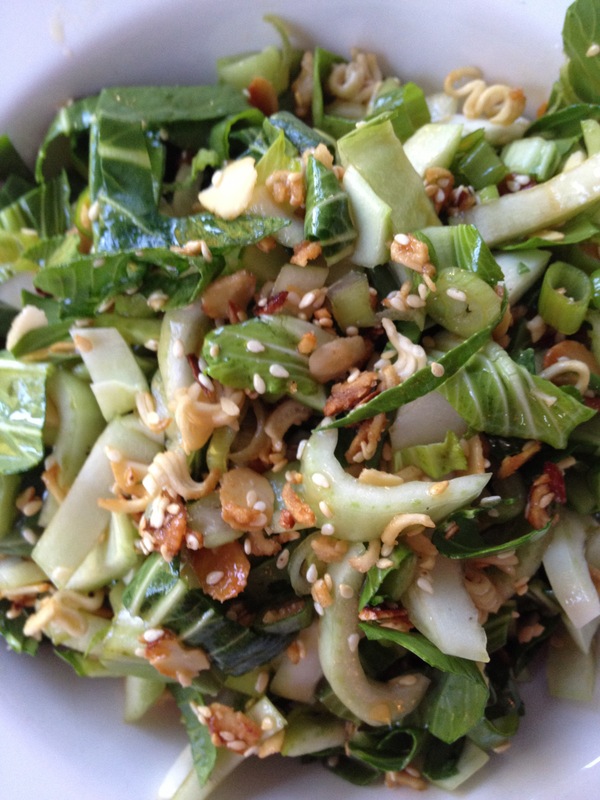 This entry was posted in Asian, Entertaining, Salads and tagged Asian, best bok choy salad, book club menus, bunko menus, salads, summer salads, vegetarian by subeeskitchen. Bookmark the permalink. Yum, can’t wait to make this updated version of an old classic! I am making this immediately! Perfect dinner during this heatwave we’re having. Thanks, Sue! I like the sweet ramen idea and I make this w/ the prechopped red cabbage to save time (and we LOVE it) too. Great idea with the prechopped red cabbage!Easy and colorful. Is sesame oil different from sesame seed oil? 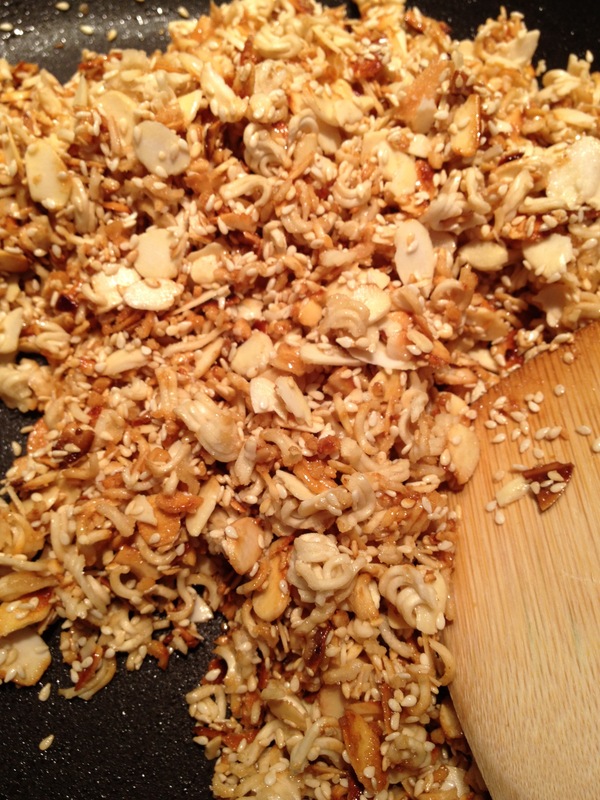 It’s the same; toasted sesame oil has a nuttier, more complex flavor so that’s what I use. 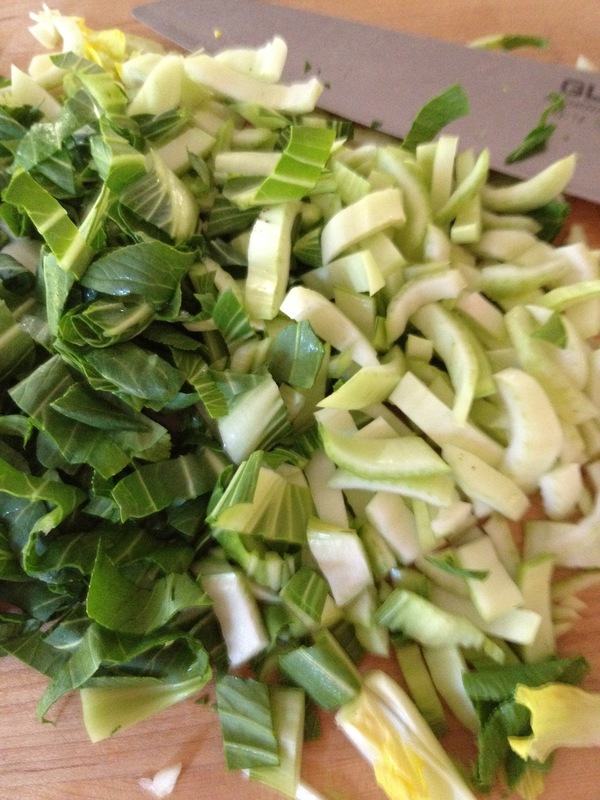 What do think of celery in place of ok choy? And pecns instead of almonds? 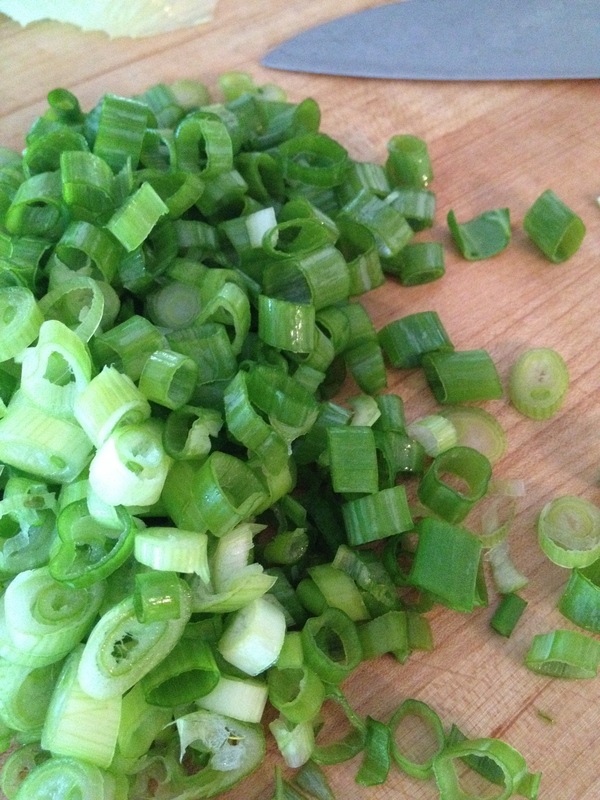 Hi – I like celery but I think that would be too much celery. (It would overpower, IMO.) 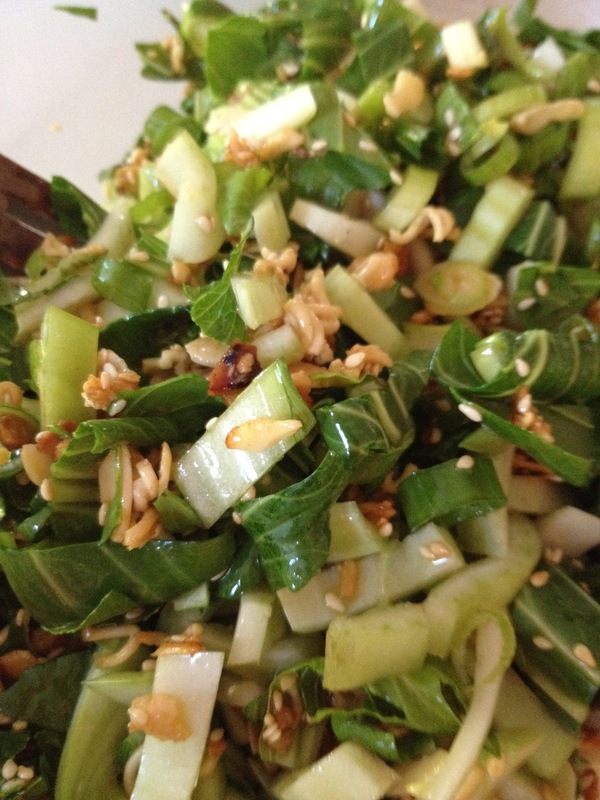 I’ve made this with chopped romaine instead of bok choi, though. Pecans would be good. Let me know how it turns out! I have made this many times but can not seem to locate my recipe. 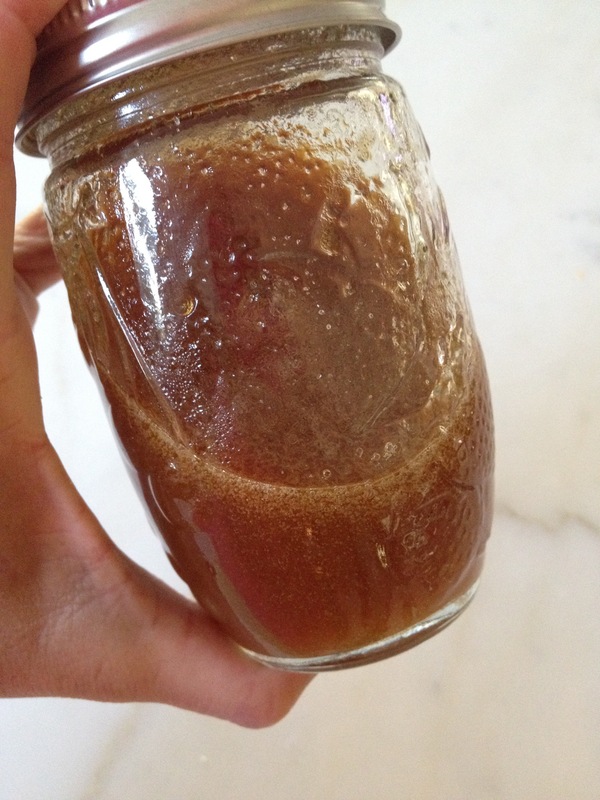 I remember that I cooked the vinegar and the soy sauce and added the sugar at the end and the sesame seed oil. Do you know anything about this version ? Have never seen a version like that. Sounds interesting! But in the meantime, try this version and let me know what you think.